BambooHR is an online human resources (HR) software service that offers an end-to-end solution for your workforce management. It is currently the highest rated HR solution in our review base. It also won our Best HR Management Software Award for 2018 as well as the Expert’s Choice Award for 2018. The software provides small and growing companies with a user-friendly platform where they can migrate data from complex spreadsheets to a modern Human Resource Information System (HRIS) that fits their specific requirements. If you want to see the system in action you can easily schedule a live demo here. With this service, HR professionals can focus their time and efforts on more important tasks. BambooHR’s Applicant Tracking System (ATS) can administer all aspects of the employee’s life cycle, and provide the necessary personnel visibility using strategic indicators such as retention and turnover. The first thing that attracts attention when looking at BambooHR is how sleek and modern its interface looks, with a recognizable color template that makes HR management enjoyable rather than boring. As irrelevant as some businesses believe appearances to be, they play an important role in managing workforce, particularly in a larger team. The most important thing is the BambooHR comprehensive feature suite. Inside, you will find all relevant HR functions, personnel data modules, tracking capabilities, and advanced reporting opportunities. Built for small and medium-sized businesses, the system utilizes a stripped-down mechanism to follow the performance, which makes it a very good choice for growing companies. We also recommend it to remote and decentralized teams, due to the fact that it offers flawlessly performing apps for all operational systems. At the same time, BambooHR turns applicant tracking into an optional system, as it provides you with the possibility to integrate it with more than 20 HR systems and business management apps. The Open Application Programming Interface is there to expand some of the most critical capabilities of this system, including expense tracking, reporting, and benefits administration. 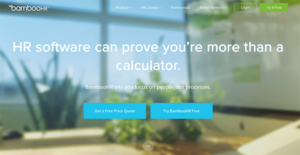 What may also be interesting for prospective buyers is that BambooHR has a quote-based pricing scheme, where each package, be it an SMB or an enterprise one, is tailored to meet the needs of the client. Before making a final decision, though, you may want to check their free trial to see if their features are actually what you’re looking for. BambooHR makes hiring and employee management considerably easier and is better than most other HR systems. This is mostly because of its optional applicant tracking system. It displays job openings in a separate tab, where the user gets to see all applications, applicant leads, and select/eliminate applications as they arrive. In a similar way, you can add new job openings with all relevant details such as salary, title, duration, contract type, etc. One way to do this is to use a filtered dropdown menu, while the other is to use the system’s special text editor and to add a longer description. Once the list is ready and completed, the users can share it on all social networks or popular job boards to make sure applicants know about them. When it comes to freshly hired employees, Bamboo HR does an outstanding job as well. New hires receive a special email containing training information and access to all system files and corporate documents that may be relevant to them. This can save the manager a lot of time as the new user can import their personal information to the system, and establish connections with the other employees. Needless to say, they will also get to participate in every discussion, training, or event from the very first moment they log into the system. Following the concept of traditional HR management, this well-integrated platform provides role-based access to information. The main figures in the system are administrators and managers who are in charge of delegating competence to other users listed on their dashboard. It is exactly them who will be responsible for creating employee profiles and inserting all related information in their portfolios. The Employee section is placed right next to the Job Opening sections, joining a list of other tabs such as My Info, Files, and Reports. Basically, this system makes it possible to use your account and manage corporate activities from the very same eye-pleasant dashboard. Your next and most important question is probably the one about benefits management and performance administration, where we also have many positive things to say. All administrative power is collated in the Employees tab and its organizational chart that can be easily customized. Once the administrator assigns tasks in the chart, employees are notified and can start working on them immediately. Time-off balances and benefits are added in the same way, for the employee to have a constant overview of them. How exactly does Bamboo HR manage performance? The first thing you should know is that the system doesn’t analyze performance on 6-months or annual basis, but compares individual actions to common goals every day, without even being triggered to do so. There is a quadrant-style matrix plot that uses this information to compare employees to each other and distinguish the top performers among them. This is not only important for rewarding talented professionals and improving the work of new hires, but also for detecting trends that can boost the profit of the company. The most serious benefit of using Bamboo HR, however, is administering benefits: the centralized database contains the benefits for each employee and allows the manager to track them down no time. There is an overall number of 12 benefit types applicable to all groups of employees, and it is employees who can change them upon every update in their status (health insurance, marriage, and much more). What is impressive here is that Bamboo HR offers a modifiable rate health plan, meaning that the user can easily track even age-based plans, and calculate automatically the variable amounts his employees have to pay. For the same operation, companies can choose third-party programs that are integrated with the system. The cherry on top is definitely reporting capabilities. Alongside the standard Equal Employment Opportunity reports, you can use this system to pull out benefits reports. The reports are based on files stored and categorized in the virtual database, and will automatically summarize and consider all applicable taxes. Just like all other important operations in BambooHR, reporting can be done using a mobile device. If you are interested in BambooHR it may also be a good idea to investigate other subcategories of Best Applicant Tracking Software gathered in our base of B2B software reviews. Since each enterprise has particular business needs, it is prudent for them to refrain from seeking a one-size-fits-all ideal software application. Needless to say, it would be futile to try to find such a platform even among market-leading software platforms. The intelligent thing to do would be to jot down the various vital factors that need consideration such as required features, finances, skill levels of staff members, company size etc. Then, you should do your research thoroughly. Read some BambooHR reviews and investigate each of the other systems in your shortlist in detail. Such exhaustive homework can make certain you discard ill-fitting platforms and choose the system that offers all the aspects you need for business success. We realize that when you make a decision to buy HR Software it’s important not only to see how experts evaluate it in their reviews, but also to find out if the real people and companies that buy it are actually satisfied with the product. That’s why we’ve created our behavior-based Customer Satisfaction Algorithm™ that gathers customer reviews, comments and BambooHR reviews across a wide range of social media sites. The data is then presented in an easy to digest form showing how many people had positive and negative experience with BambooHR. With that information at hand you should be equipped to make an informed buying decision that you won’t regret. A big fan of this software! Their customer support and HR system is great! Growing businesses should consider using the platform. What are BambooHR pricing details? What integrations are available for BambooHR? Pros: I love everything that BambooHR has offer. As an HR director, it completely changed the way I work. Back then, I did all my HR functions manually. I did it the old way. It took up a lot of my time. Ever since I began using BambooHR a few years back, I was able to free up time to concentrate on people. My team loves user-friendly this software is. Cons: I like everything about the system. The only thing I was hoping they might have is their very own time tracking module. Still, I can't wait for them to roll out such functionality. That way, I can rake in all the functionality into Bamboo. Pros: For going from spreadsheets to your first HRIS, Bamboo might be ok for you. Cons: Very simple functionality, HR professionals and HRIS Analysts have worlds of issues. It's just a data base, and highly customizable and therefore they don't let you make any configuration changes yourself. Since it is geared toward very small orgs they assume that no one with any technical knowledge is touching the system. For a company big enough to have an HR department and a systems analyst this leads to big problems. I could overlook it if the service was great...but I have NEVER had support actually solve my issue on the first contact. You've got to jump through hoops to get them to actually do something to your system. Already implemented? $100-200/hour if you want them to do something that takes more than a few minutes. Look elsewhere! Has casted light into the world of corporate HR. HRIS that simply works great for HR and employees! If you need more information about BambooHR or you simply have a question let us know what you need and we’ll forward your request directly to the vendor.